I noticed that my entries are absent of side dishes. Lately I have been cooking some staples for meals, because it is a hectic time of year for us. Stuff that I posted already, likebaked spaghetti squash, taco meat or a fritatta. I have cooking and baking ideas, but a lack of time to implement. I am sure I am not the only one out there that has more project ideas than time to do them. You should see my Pinterest boards! So many things to do, so little time. This is a simple side dish that is easy, high in fiber, filling and my family loves it. Great as a base for many a dish as a substitute for rice, pasta or other grains. Don’t forget the nutmeg – it sounds odd, but works so very well with the cabbage. In large saute pan heat olive oil over medium high heat. Chop cabbage in 1/2-inch to 1-inch pieces. 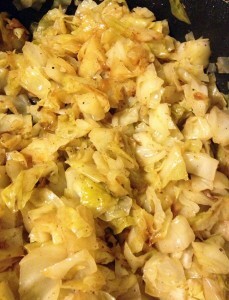 Toss cabbage in pan and stir to coat in oil. Sprinkle with salt, pepper and nutmeg. Continue cooking and stirring until about half of the cabbage begins to brown. Turn down heat by half and cover. Cook for another ten minutes or so, until all the larger chunks are softened. Keep covered until ready to serve, then do so immediately while it is hot. If preparing it in advance and chilled, it is easy to toss it in a hot saute pan and serve hot.